Trying to think of a way to start a match report usually takes a bit of thought, but this time, the final score is the headline and the only place to start. Taking account of current league positions a Falcons victory was always a real possibility but it was the manner of the Quins defeat that is most disturbing. Quins 10 Newcastle Falcons 28 was the result of a real workmanlike performance from the visitors with a Quins showing being best described as dire. 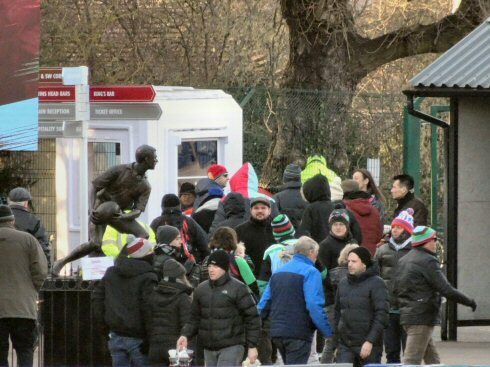 Little wonder that a good proportion of the home fans showed their displeasure of the Quins performance by leaving their seats well before the end of the match. Not something I have ever done during my 20 years supporting Quins but I can understand why some do. As usual travelled to the game full of hope, dry sunny conditions albeit very cold, and with James Horwill and Charlie Walker back in the line up and the long awaited return of Demetri Catrakilis in the squad, I felt that the hope was not totally misplaced. Before Marcus Smith got the game underway there was a short period of applause in remembrance of the Doncaster Knights prop Ian Williams who collapsed and died during training earlier in the week. The first five minutes of the game saw both sides feeling each other out but the second penalty against Falcons on six minutes allowed Marcus Smith to find touch deep inside the Falcons twenty two. Ben Glynn won the line out and following a couple of drives to the Falcons line it was the Quins captain who finally touched down for the first points of the game. A straightforward conversion from Smith and the home side were seven points ahead after only eight minutes, an encouraging start. The first scrum of the game goes to Falcons as Charlie Walker spilled the ball on the halfway line and before it can be taken Calum Chick replaces wing forward Mark Wilson for the visitors. Falcons are awarded a free kick from the scrum and play is halted shortly afterwards as the two number eights engage in a bout of handbags. 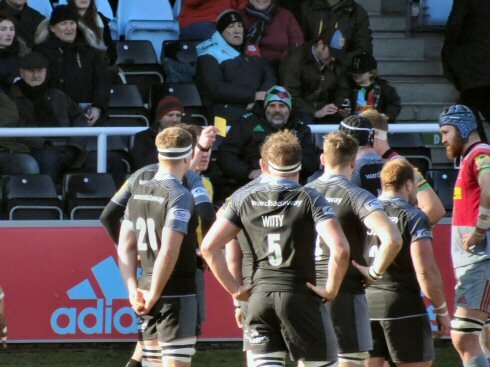 After consulting with the TMO referee Foley sends both Chisholm and Latu to the sin bin for ten minutes and awards a penalty to Falcons which is kicked to touch in the Quins twenty two by Toby Flood. Quins infringe in the line out allowing Flood this time to find touch five metres out from the Quins line. Quins defend the line out but are once again penalised allowing Flood to find touch for a repeat line out. Falcons yet again turn down the kick at goal and another line out and catch and drive sequence eventually breaks down as the ball is turned over inches from the Quins line. Quins clear the ball to the ten metre line but although they lose the line out the defense holds strong before Falcons are again penalised allowing Smith to find touch this time on the Falcons ten metre line. Quins put together a few phases and as the game enters the second quarter a pass from Ward to Kitto sees the latter knock on the ball allowing Latu and Chisholm to return to the field of play. Quins are soon on the attack once again and are awarded a penalty for off side 30 metres from the Falcons line which is pulled wide by Smith. Aaron Morris is replaced by Tim Visser before the game restarts with Charlie Walker moving to full back. A period of loose play from both sides sees Kitto pick up the ball inside his own twenty two and weave his way through the Falcons players until he eventually spills the ball just short of the Falcons twenty two. A counter attack by Falcons eventually leads to a penalty as the Quins defense strayed offside and Flood once again turns down the kick at goal and elects to find touch in the corner. The catch and drive from Falcons is held up over the line but Joe Gray is yellow carded for collapsing the maul. Another Falcons five metre line out is wasted as Quins steal the ball and Jono Kitto clears the ball into touch but Falcons are again quickly on the attack and are awarded another penalty as Kyle Sinckler plays the ball while off of his feet. Flood turns down yet another easy kick at goal and Quins find themselves defending another five metre line out which eventually results in Calum Chick crossing the line for Falcons under the posts. A straightforward conversion from Flood and the scores are level at seven points each seven minutes from the break. It is not long before Falcons mount another attack and Sinckler is penalised again in mid field allowing Flood to push the Falcons attack up to the Quins twenty two line. Falcons continue to batter the Quins line but cannot cross it as Quins keep them at bay but continue to keep conceding penalties in the process. As Gray returns to the pitch the referee again loses patience with Quins and with clock in the red it is Alofa Alofa who this time is sent to the bin. Yet again Falcons turn down an easy kick for three points in front of the posts electing for the scrum which Quins defend well as Scrum half Youngs spills the ball with the clock showing 44 minutes. All things considered, Quins were fortunate to get through to the break with the scoreline all square with Falcons keeping Quins pinned in their twenty two for long periods as well as turning down many opportunities for what looked to be straightforward penalty conversions. Having said that the Quins defense was very effective despite giving away multiple penalties and seeing three yellow cards. Following Floods drop kick to start the second half not much headway was made by either team with play being confined within the Quins half until a spilled ball by Falcons led to the first scrum of the second half. Quins win their own ball at the scrum and a break by Marcus Smith brings play into the Falcons half of the field. Smith passes to Kitto who gets the ball to Dave Ward who takes play deep into the Falcons half before Falcons are penalised for killing the ball. Smith elects to take the kick which is successful taking Quins into the lead again after 47 minutes, an encouraging start to the half. The lead wasn't to last however as Falcons secured the ball from the restart and after a number of phases a fine break by Matavesi almost let Hammersley in for a score. Falcons press the line from a metre out and Kyle Cooper manages to get the ball down to score Falcons second try of the match. The conversion is straightforward by Flood taking the score to Quins 10 Falcons 14 after 51 minutes. Alofa comes back onto the field and interestingly he missed about 15 minutes of actual play, presumably the “overtime” play at the end of the first half is not counted as part of his 10 minutes suspension. Falcons game plan is pretty clear as they play the ball deep into Quins territory at every opportunity and once there keep the ball in hand and pressure the Quins defense. The tactic pays dividends when Falcons outside centre Chris Harris almost strolls through a gap between Wallace and Visser to touchdown from 20 metres out. Another successful kick from Flood and the score moves on to Quins 10 Falcons 21 after 55 minutes as there is a distinctive shift in mood from the home supporters. Loads of endeavour by Quins over the next ten minutes but the efficient Falcons defense ensured that play never really got close to their twenty two and on the odd occasion that it did, Quins managed to spill the ball. Fifteen minutes into the half and a long clearance kick from Falcons is well chased as Alofa is challenged when fielding the ball and a spilled ball from Smith sees Falcons win a scrum 8 metres out from the Quins line. Falcons win the ball and as scrum half Youngs runs a decoy line infield the ball is passed out to Sinoti Sinoti who touches down despite the attention of Chisholm. This time replacement Hodgson is successful with the conversion and Quins now find themselves et the wrong end of a 10 – 28 scoreline with about 13 minutes of the match remaining. Some parts of the crowd now becoming quite hostile as booing can be heard around the ground but a little bit to cheer as Demetri Catrakilis comes onto the field for the first time since September to replace Marcus Smith. Kitto, Wallace and Horwill also leave the field being replaced by Lewis, Matthews and South respectively. With Falcons well in control of the game, things do not get any better for Quins as Falcons replace their complete front row with 10 minutes of the match remaining. There was quite an exodus from the stands at this point with many of the home supporters demonstrating their dissatisfaction at the current state of affairs at the club, not nice to see but understandable. For the remainder of the match despite plenty of endeavour from Quins, Falcons just did enough to ensure that the scoreboard was not troubled again. I have to admit that it took a long time to even think about starting to write this report as I left The Stoop feeling pretty depressed on Saturday and even then I decided to wait until the match replay was available to see how bad things really were. Interestingly, in my opinion (thought I had better add that), the performance wasn't nearly as bad as I remember, and despite claims from some that the team just gave up, they are well wide of the mark. There has been so much talk over the months about the Quins defense but I have thought for a long time that the attack is often left wanting when up against a well organised defensive system. Falcons came with a game plan, defended well, flooded all over Quins whenever Quins had the ball and took their scoring chances whenever they were presented with an opportunity. Clearly all is not well with Quins at the moment but the best way to sort things out is another matter. I suspect it is a lot more complicated than just getting rid of A or B but sometimes in these circumstances somebodies head has to roll. Some good points; Mark Lambert put in another good eighty minute shift, Charlie Walker looked lively whenever he had the ball and Catrakilis seems to have navigated his 15 minute appearance without mishap. Failed on many counts unfortunately. Edited 1 time(s). Last edit at 2018:03:06:14:50:14 by DOK.